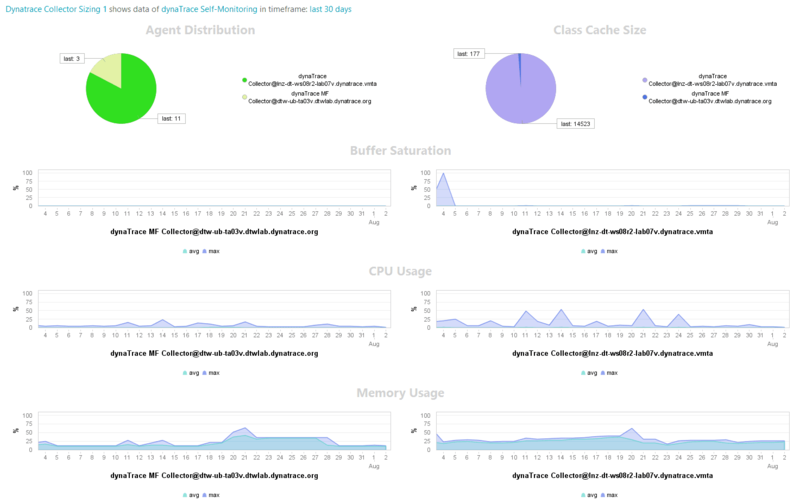 The Dynatrace Collector Sizing dashboard displays sizing-related configuration issues in your AppMon Collector deployment. Proper Collector sizing ensures a highly scalable deployment that performs well. Use this dashboard to size and tune your system optimally. Agent Distribution: The number of Agents that are connected to each Collector, based on the last available measurement. Class Cache Size: The number of loaded classes per Collector, based on the last available measurement. Buffer Saturation: The buffer utilization as a percentage per each connected Collector instance. CPU Usage: The CPU usage per Collector. Memory Usage: The memory usage per Collector. Observe the rules for how to distribute your Agents over Collectors for different applications and subnets. You should balance the load. For example, if there are two Collectors and one receives two thirds of the load (or Agents), redistribute the Agents to balance it.